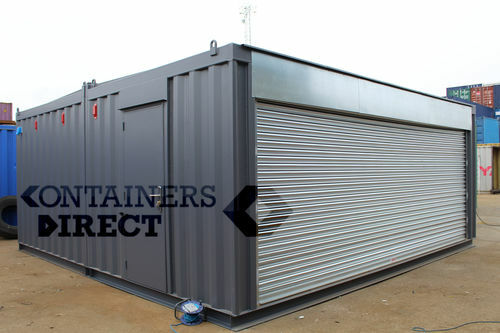 We are industry leading shipping container conversions specialists, and have been one of the biggest converters in the marketplace for a number years. 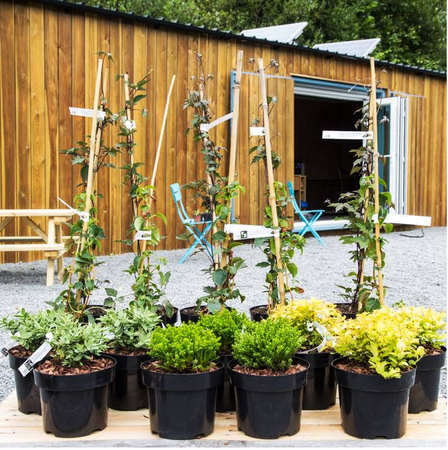 We have worked with a variety of customers on different projects: from bespoke site offices to pop-up shops, from big brand names like Superdry to the local self-starters, like Coffi Camlan Garden Centre in Snowdonia. And our own office is, of course, a building constructed from eleven joined up shipping containers! 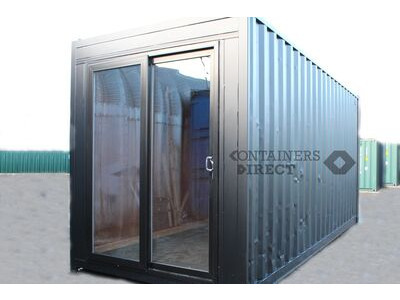 Watch our container conversions video to find out more. 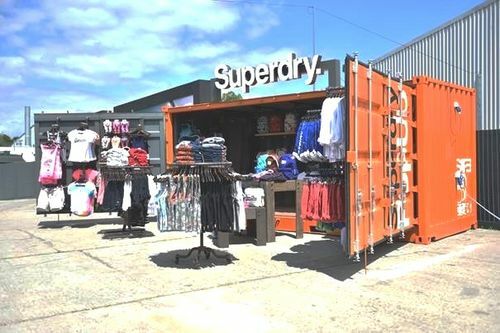 Our shipping container conversions are versatile, modern and durable, and cover a wide variety of purposes, such as mobile catering units, pop-up shops, site offices, classrooms, changing rooms, chemical stores, toilet blocks, animal shelters and even living accommodation. 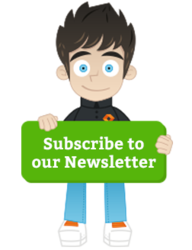 Get in touch with your design ideas! It all starts with a sketch. To start your conversion project, you can email a rough sketch or plan of your proposed project to our team and we will return with a quick-quote. Or, if it’s more convenient, give us a call and one of our Sales experts will be able to discuss your project with you in detail to get a greater understanding of what you’re looking for. This member of staff will then become your dedicated Account Manager, working closely with you from the design phase to the completion of your project. We have also expanded our conversion workshops, which means we can now provide a faster and more extensive service from our in-house fabrication depot. 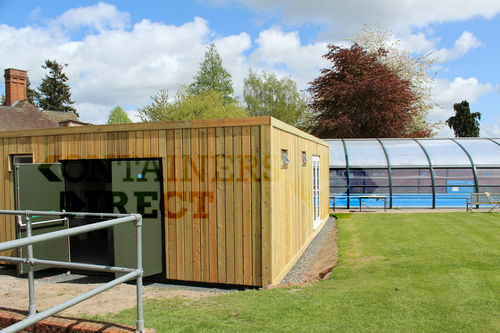 One of our favourite shipping container conversion projects was for a school pool changing rooms using four 20ft once-used containers, all joined together side by side to create a 20ft x 32ft space. 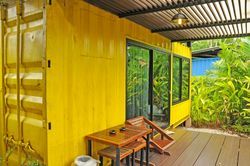 The exterior of the unit was fully cladded, and through the French patio doors in the side was a small lobby, with a boys and girls changing rooms to the left, two toilets and a shower area, complete with fire escape doors and a personnel door through to the pool. All of the units had their own electrical supply and we also installed a boiler to supply the showers with hot water. This unit was put together on site and made an excellent addition to the school grounds. 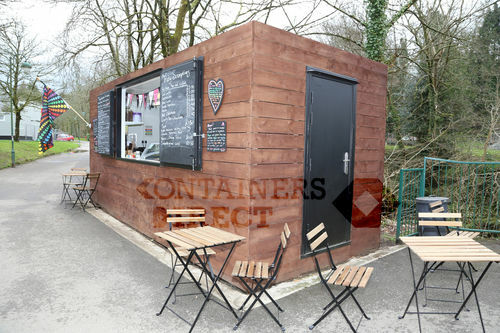 This pop-up catering unit was created out of a simple 20ft container, with external cladding and a barn door style hatch in the side for serving. The unit had a personnel door for staff entry in the short side, and was also fully melamine lined and insulated with electrics throughout. Our client did the internal fit out themselves, and today it stands as the Trudy Scrumptious Café in Tavistock, serving home-made ice-cream, toasted sandwiches, cakes, tea and coffee. Sometimes standard size containers just won’t do the job. 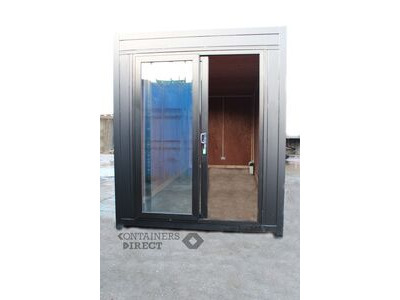 As well as converting containers, we also specialise in building from scratch to bespoke sizes as required. For this project, our customer needed a 20ft x 20ft space as a bespoke garage, so we built two 20ft x 10ft units, with three long sides missing from the build. We then fitted a 20ft wide electronic roller shutter, internal electrics including lights and plug sockets, and a steel personnel door. The unit was finished off by repainting the unit in Anthracite Grey. 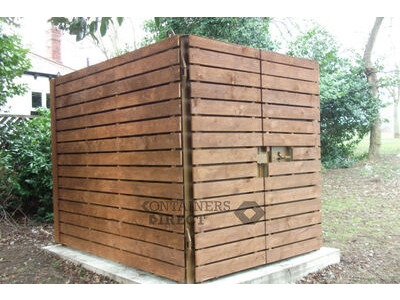 For delivery, the two units went separately, and were fitted together on site.